Mood board: The notes referred to a certain familiarity in the season’s silhouettes, framed against an ostensibly natural world. A multi-colour pterodactyl print silk shirt suggested that Jonathan Anderson’s biosphere is one nurtured by the peppy gait of his frenzied fans. The clothes and accessories were blown up and bold with a dose of punk spirit; an irregular striped shirt was laser cut into a makeshift broderie anglaise. The label’s material expertise was also there in the leather pieces that were treated to look like denim. Finishing touches: Owing to Anderson’s survey of exaggerated classics, the puzzle bag made its menswear debut for next season and a military oversize backpack was printed with a giant mushroom motif. The brand’s iconic elephant purse was punked-up too and updated with piercings and chains. 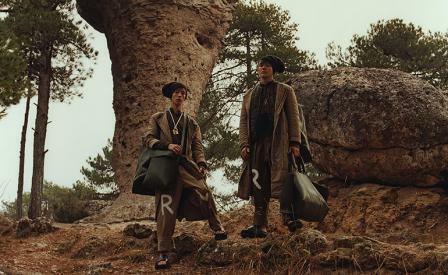 Team work: ’Past, Present and Future’ is the mantra that has been leading Loewe’s reinvention since Anderson joined in 2013. M/M (Paris) have been central to the rebranding and for A/W 2016 they created an abstract biomorphic world filled with mushroom-shaped plateaus and modular elements. The collection was displayed to museum standard on specially built globular stands.